In November, we attended and presented at eXtreme365 in Long Beach, CA. It was a fantastic event – high quality content, great speakers, a good venue, well run, even excellent food – all enjoyed by hundreds of Dynamics attendees from the whole spectrum of technical, business and leadership of top US and some EMEA partners. 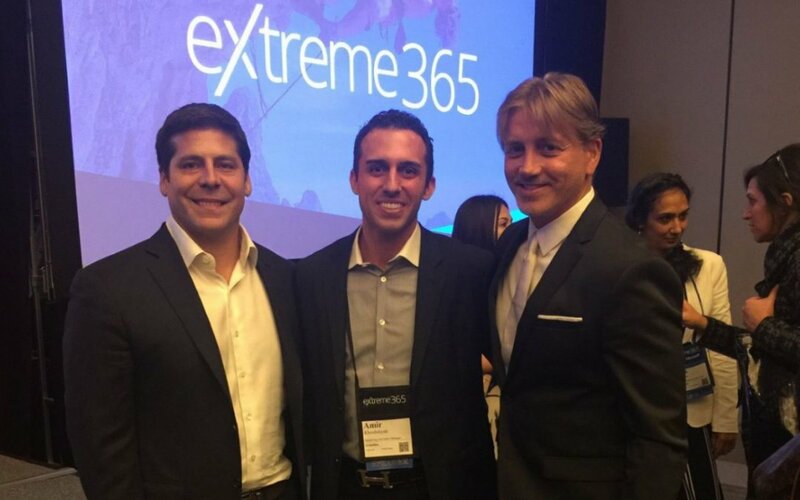 The eXtreme365 team run two events each year – one in the US and one in EMEA – we highly recommend you attend. We’ll be picking up more detail on some of these subjects in future blogs. 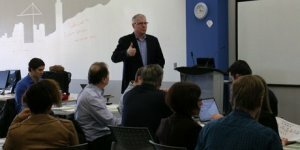 eXtreme365 veteran and CRM MVP Rick McCutcheon’s presentations on how to (and how not to) position Dynamics 365 with execs in sales and presales meetings was passionate, clear-speaking, added real common sense, and shone a light on something which so often goes wrong through poor planning and practice. 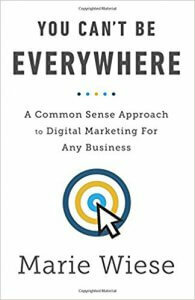 For a breath of fresh air on how to do digital marketing, follow Marie Wiese at Marketing CoPilot and read her book ‘You can’t be everywhere’. Digital Marketing is not that complex, it’s just that a lot of ‘advisors’ tell you it is. It isn’t a replacement for traditional marketing, it is a complementary part of the mix. How can your firm bridge the gap between marketing and sales and develop a content marketing and social selling strategy that will take you from online visitor to potential sale? Marie cut through this with some simple, clear steps that will help everyone promote their business in an effective way. We’re packaging up some of this innovative thinking and best practice and will be publishing it soon. Getting in Position to be in Position – Is it Buy or Sell Time? Linda Rose’s information-packed session on what she learnt from selling 4 tech businesses over her career, how to transition to the cloud while organising your own firm for maximum value, how amazingly positively Dynamics businesses are currently viewed by investors thanks to the refresh being brought about by Satya Nadella, and how to use current valuations (depending on partner type) and what growth and EBITDA need to look like for a successful transaction to occur between the acquiring and selling companies. Sam Miller, VP Sales of HSO, addressed some of the effects of CRM and ERP coming together as Dynamics 365 in his informative presentation about selling CRM and ERP in the cloud. 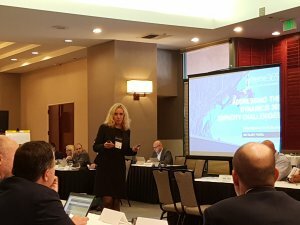 For instance, “Can a CRM person sell the value of ERP and can an ERP person realize when CRM is the right approach?” which is an ongoing subject which came up once again yesterday at our own board meeting. 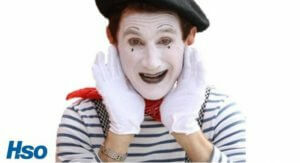 Sam’s presentation was full of lots of great anecdotes and ‘how to’ stories, helped along by his own mime artist – yes really…..
A subject close to all of our hearts – why do projects fail, and what can we do to make sure they don’t? Bob Green is Lead Partner for SingerLewak’s business software lifecycle team, and did a vibrant talk through key reasons, but also that many firms think that the biggest problems start at the point of solutions delivery – and they should think again. Many key issues start far earlier, with the way the partner sells, and the customer buys and sets up their team. You can follow our view on this subject from our seminar session held in Summer 2017. When is the next eXtreme365 event? 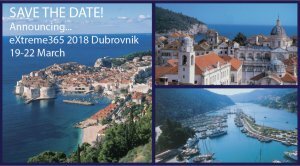 The next eXtreme365 event is in Dubrovnik, Croatia, 19-22 March 2018, with specific tracks for top Dynamics partners and for Dynamics end user customers. Have a look at the Agenda here. Whether you are technical, functional, or managerial, it’s definitely worth the registration fee and your time in attending. We thought Long Beach was excellent. It’s worth taking this offer up to save €500 – if you find you cannot go, you can cancel your booking before 16th Feb and get your money back less €100 service charge. Register before 14th December and pricing the partner track is €1295 and the customer track is €295. The relevant registration pages are here for Dynamics partners and here for Dynamics end user customers.